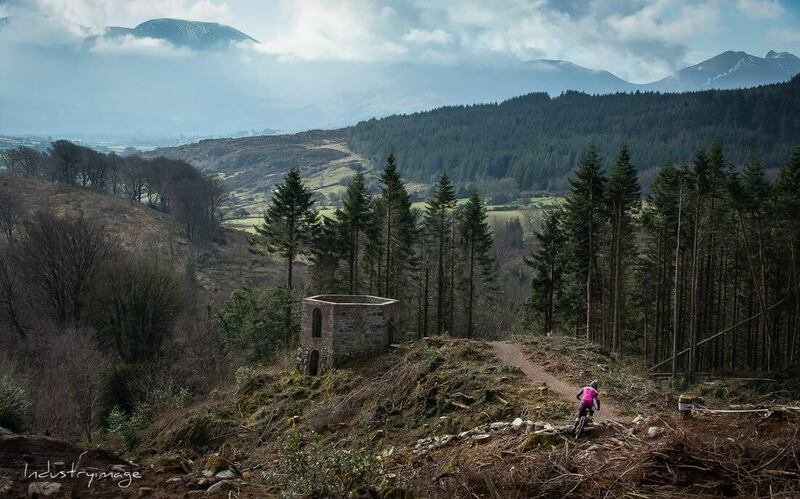 The Vitus First Tracks Enduro Cups are held on some of the finest trails in Northern Ireland. Aimed at intermediate to advanced riders there are 4 rounds in the series and each venue has its own unique set of challenges. Each round is between 16-28km long (including transitions) and consists of up to 6 timed stages of natural single track/trail centre trails that are mostly gravity orientated. Stage times are added together for a total time that decides positions in each category. Picking up 1st place here’s Michelle’s race report. This weekend I headed off in my van for another weekend of racing, thrills and spills! After being down south in Co.Cork last week, this week I was up the other end of the country in Castlewellan Forest Park for the first round of the Vitus First Tracks Enduro Cup. After a full afternoon of practicing each of the five stages I headed back to the campsite for a hot shower and a serious feed! Feeling really content with how practice went I spent the evening chilling out at the campsite and enjoying my first night camping in the van since last summer. I woke up the morning of the race feeling really fresh and full of energy. I had taken it pretty handy in practice, walking most of the hills on the transitions, saving my legs for race day. Smart nutrition post practice also made a big difference so I was glad for the race experience to know what works for me and what doesn’t. Stage 1 was one of my favorite stages. Starting off on a tricky boggy section, which was much worse in practice, I slid my way down the track through deep ruts, over boggy drops and around fun corners. Then it was a short fire road sprint into the forest onto the fast singletrack to the finish line. Stages 2 and 3 were both great craic, and stage 4 had similar technical shoots and drops to stage 1. Stage 5 was the one stage where all the last remainding power and endurance in the legs was needed as this was a full on trail centre sprint to the end with a fun pumptrack into the finish! It was great coming into the crowds of spectators cheering and clapping as I pumped my way around, giving every last ounce of energy I had left in the tank! Glyn and Cat O’Brien, as well as the rest of the First Tracks crew, provided both racers and spectators with a super weekend long event that definitely has left me wanting more! To take the win was just the icing on the cake! Thank you and well done guys for such a brilliant race! Congrats to pinner Hannah Harvey on 2nd and Spaniard Tracy Bisbin on 3rd!